JUPITER, Fla. Nov. 10, 2013 — The scouting report on Raleigh pitcher Johnny Gonzalez was clear: score early, because you probably won’t score late. Long Island’s heavy hitters learned that in the 35 Central Wood Bat title game. Gonzalez retired 23 of the final 26 Long Island hitters to earn co-MVP honors with Chris ‘Meat’ O’Connor, and finished the week allowing only two runs in 24 innings pitched. His dominance helped the Red Sox earn their first Fall Classic tournament title since 2007, and it cemented his legacy in Jupiter. With an overpowering fastball and pinpoint control, Gonzalez spent most of the day in favorable counts against a powerful Brewers’ lineup. That team entered the finals with a 6-1 record, counting two blowout wins in the playoffs, and scored nearly 80 runs. Gonzalez struck out seven hitters just a day after pitching six no-hit innings in a quarterfinal 19-7 blowout of the Venezuela Lanceros. 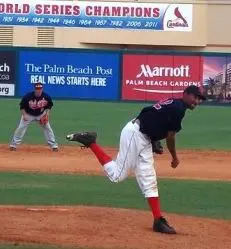 Teammate Mike McCreery threw a complete game in the 9-2 semifinal win over the Long Island Senators. Gonzalez’ week started with a complete game shutout, and ended with a 3-0 record. In what was a recurring championship game theme, Raleigh started quickly, scoring a run in the first on Korre Humes’bloop single to center that scored Gonzalez from second and two more in the second on RBI singles from Dom DiDonato and Dan Hiss. Long Island battled back to pull within 3-2 in the third on a run-scoring error and Billy Pisani’s single to left that plated Will Horan. But that’s all the Brewers would get. Gonzalez gained strength, his fastball gained speed, and the swift, powerful bats of the Long Island hitters, so used to scoring runs in bunches, seemed to gain weight. By the time the Brewers threatened again, it was the bottom of the eighth inning and run-scoring hits from Damian McFadden, Paul Regan and Humes, as well as generous defensive play, had pushed the Raleigh lead to a more comfortable 6-2. Humes was the hitting star for the Red Sox, going 3-for-5 with three RBI and a double, while, James Harris, McFadden, DiDonato, O’Connor and Gonzalez each added two hits. The Brewers committed six errors, leading to five unearned runs, behind tough luck starter Scott McMillan, who allowed 12 hits over eight strong innings.